Casa Almendro is located in the lushly landscaped gated and very secure complex of La Ceiba Suites in the Playa Madera district. 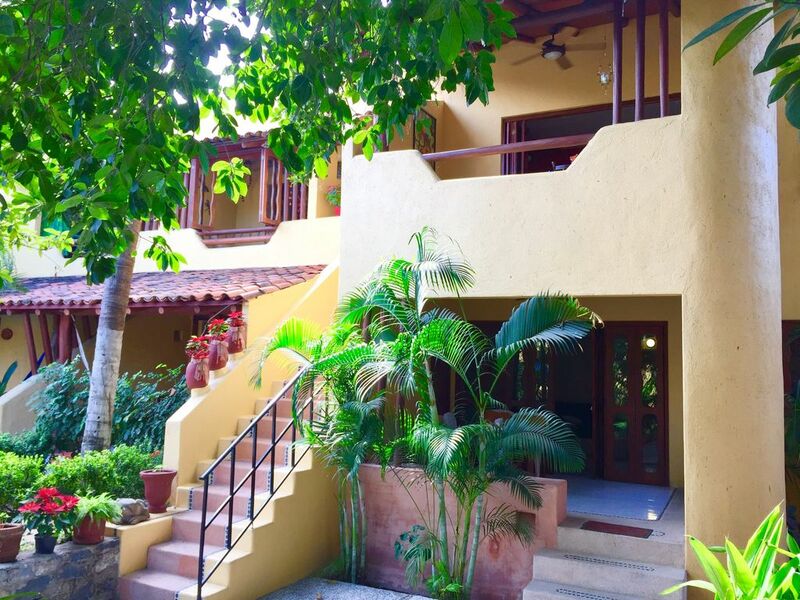 La Ceiba Suites complex is conveniently and centrally located close to the town center of Zihuatanejo so no car is necessary as you are just steps away from all amenities. Despite being so close to town it is an amazingly private and quiet location. Within short walking distance from the condo there are too numerous to count delicious restaurants serving a broad range of tastes and prices, shopping and entertainment. If needed, taxis and buses are available to you just outside of La Ceiba Suites doors for just a few pesos. Playa Madera beach is an easy short 0.2 mile 5 minute walk from the condo and Playa La Ropa is an approximate 15 minute walk or 5 minute bus/taxi ride. La Ceiba Suites complex has a strong Mexican architectural feel with well manicured lush tropical vegetation throughout. Our condo, Casa Almendro, is a very private and spacious 1020 sqf unit found on the 2nd floor of the complex. Casa Almendro has a very spacious open air concept with Mexican architectural influences with rich tropical hardwoods found throughout the unit. There are views of the tropical landscaping from every window and from the additional two spacious balconies found in the condo. The master bedroom has a king bed with nice quality mattress and pillows, over the bed fan, in room air conditioning and in-suite full bath with walk in shower, stone detailing and Talavera ceramic sink. Right off the master bedroom tropical hardwood french doors lead you to a large open private balcony with built in cushioned seating overlooking the lush vegetation and common area below. A second large full bath with stone detailing tub/shower and ceramic Talavera sink is conveniently located off of the main living area. The main living area stays very comfortable with the 3 overhead fans and the open air balcony providing good air circulation. There is a 32 inch flat screen color TV with cable, wireless internet and built in cushioned seating with numerous pillows for your afternoon siesta. The Fully equipped kitchen is perfect for renters who like to cook full meals with a 4 burner gas range, fridge, microwave, coffee maker, blender, toaster, large supply of cookware, cooking utensils and storage containers. Off of the living room/kitchen area through accordion style hardwood doors there is a spacious open air covered balcony. It has additional built-in cushioned seating, glass dining table with four chairs and overhead fan. The dining room balcony has a view overlooking one of the two pools located on the complex grounds. Nice quality bed linens, towels & beach towels are provided to our guests. For our guests staying longer than 7 nights, a weekly maid/cleaning service and linen change is provided for no additional fee. Vanessa, our condo manager will greet you upon your arrival to La Ceiba Suites. She will introduce you to our unit Casa Almendro, give you instructions for your stay as well as answer your questions. Casa Almendro is a non-smoking unit, there is a designated smoking area. The complex has two lovely generously sized pools with plenty of seating, tables and loungers. If you are flying into the Ixtapa/Zihuatanejo airport, it is an approximate 15 minute taxi ride to the complex. DISCOUNT RATE: Please check my calendar for availability. A 15% discount will be provided for stays 28 nights or greater. This is automatically generated via VRBO instant quote for your viewing. We welcome you to Casa Almendro our home away from home in beautiful Zihuatanejo Mexico! We chose to buy in the Zihuatanejo area as we found the relaxing Mexican beachfront environment perfect for what we were looking for. The Playa Madera district is conveniently located close to town, beaches and restaurants with no car needed as everything is within walking distance. It is only a 10-minute stroll along the picturesque waterfront walkway and its many delightful local restaurants to beautiful old-fashioned downtown Zihuatanejo with its open-air market, distinctive shops and authentic Mexican night life. There are many fun activities available including first-class dining and shopping, sport fishing, kayaking, snorkeling, diving, sailing, surfing, and a variety of guided tours. Trendy La Ropa Beach is only a 15-minute walk away, and Ixtapa with its El Palmar Beach, golf courses, shopping centers, and marina is only a 15-minute ride away. We feel completely safe and have never felt a moment of uncertainty in this area. The locals are very friendly, loving & hard working people. Casa Almendro is located in the exclusive condominium complex of La Ceiba Suites. Centrally located to town, beaches,shopping & restaurants with short walking distance to all amenities. No car needed! A/C in master bedroom only for use at night with windows and doors closed. 4 ceiling fans throughout the condo: master bedroom, kitchen, dining area and main living room. Private deck off Master bedroom. Various common areas throughout the complex grounds amongst the lush landscaping or along the pools with seating for quiet relaxation, reading or sunning. There is no laundry facility on site. For personal laundry needs there is a drop off laundry service less than one block away. Inexpensive and you pay by the kg. Drop clothing items off in the morning you can generally get it back later in the day or the following morning. We loved the place, very comfy, beautiful gardens and great pool. Absolutely perfect location, friendly residents & staff. Great neighborhood. Liked the open air feel. The ninja professional blender was terrific and we had many delicious fresh fruit smoothies. Only glitch was the bedroom toilet which was running. Needs to be fixed. We ran out of water once because if it. We would definitely stay again & recommend to others. Vanessa forwarded me your email Linda. Thank you for the update, I really appreciate it. We had the mechanism and flap replaced in the water tank so this should resolve the running toilet issue. We are always glad to hear our guests enjoyed their visit to Casa Almendro and Zihuatanejo. Please come back to see us again soon! Highly recommend Shelleys place- we hate to leave! Thank you for the great review Marie. You were awesome and we are so pleased it worked out for you and Randy. Please come back soon! We absolutely loved Shelley's condo. It is spacious and very well equipped and it is obvious that the owners have put a lot of time into decorating and maintaining it. The condo is located in the Playa Madera area and it is within easy walking distance of shops, town, the beach and numerous restaurants. The complex is beautiful with 2 swimming pools and lots of chairs and loungers. We will be back for sure and we highly recommend this rental. Thank you Mark & Brenda for the awesome review on Casa Almendro and the surrounding area. We are humbled with your fantastic appreciation of our property. So pleased you will be returning to stay with us again. Your patronage is truly appreciated. Always happy to be back at Zihuatanejo & Casa Almendro. Good weather, good food, great people. Casa Almendro has always been comfortable, clean and has everything we need for a pleasant stay. The properties residents are very friendly and helpful. The property manager has always been able to help with any questions of the area. Thank you for a great property. Good weather, good food, great people and accommodations. What more can a person ask for. Thank you Shelley for being so accommodating and Vanessa for being so responsive and attentive! Our second year at Casa Almendro, and we love it! We have been coming to Zihua since 2001, and Playa Madera is were we like to stay. Casa Amendro is the perfect location, as well as being one of the best equipped and relaxing places we’ve stayed. Thank you Gail and Scott! We appreciate your kind words. I concur.... Casa Almendro and Madera is the place to be. Glad to hear you two had a great return visit. Please come back and stay with us again soon! I highly recommend Casa Almendro as a place to stay in Zihuatanejo. The second story, one bedroom condo is spacious, well-appointed, and a delight to the eye, with its arching walls and Mexican tiles. There is a pool right below the condo and we dipped in every afternoon to cool off. This was our first time in Zihuatanejo. Shelley gave us detailed instructions for navigating the airport and taxi get to our condo, which was so thoughtful. Vanessa, the property manager, is also incredibly helpful and friendly. Her English is excellent, which came in handy as our Spanish vocabulary is limited. Casa Almendro is perfectly situated for exploring all aspects of Zihuatanejo right outside your door. (Outside the (always locked) door of the condo grounds.) We stayed for a month, and we shopped in the local markets, took boat rides to Playa Las Gatas (for great snorkeling), boogie boarded 3 blocks away at Playa Madera, and walked ten minutes over the hill to Playa La Ropa. There is a taxi stand across the street, and you can easily take a taxi anywhere you want to go. The only negative we found was the noise of the streets and the loud recorded music played everywhere. This is not a criticism of Casa Almendro. It's just a warning that Mexican towns are noisy. Bring earplugs. The king-sized bed was very comfortable, and the spacious kitchen had everything we needed for cooking. I loved the indoor-outdoor living: sitting in the open air dining area overlooking the pool. There is air conditioning in the bedroom for cooling off, and fans throughout the rest of the condo. If you are looking to immerse yourself in the culture of a Pacific Mexico town, while simultaneously feeling safe and comfortable, then Casa Almendra is for you. Awesome review Heidi. Delighted you and Richard had a great visit keeping busy with lots of fun activities. Thank you for mentioning the many attributes of Casa Almendro and the properties convenient location. Please come back and stay with us again on your next return to Zihuatanejo. You were delightful guests and a pleasure to work with. It is an easy 0.2 mile (5 minute walk) from the condo to La Madera Beach where you will find a nice sandy beach you can sun bathe, swim, enjoy a beautiful sunset, have a drink, snack, or enjoy a traditional Mexican meal in one of the cafes and bistros located on the beach stretch. From La Madera beach, you can walk along the beach walkway to town to enjoy the numerous restaurants, shopping and entertainment. There is a wide choice of dining in every direction from the condo that cover a broad range of tastes and prices. If you want to get out a bit further, taxis and local buses are readily available outside of the La Ceiba Suites entrance for a very reasonable fee. Find the 'Zihuatanejo Artisans' Market' on Calle 5 de Mayo in downtown Zihuatanejo just one block from the waterfront and beginning across from the church. The market is made up of multiple small stalls for a shoppers delight. For a real taste of old Mexico, take a short walk to visit the open air 'Mercado' off of Benito Juarez. It has a vibrant Mexican feel with a large selection of little shops, restaurants and stalls selling fresh local produce, meats and goods. There are activities galore and numerous beaches to visit locally such as Playa Principal, Playa La Madera, Playa La Ropa and one of our favorites is Playa Las Gatas which can be reached by water taxi from the main pier. However, if you get the itch to get out a bit further for the day there are several small beach communities that are fun to travel to by bus or taxi such as Playa El Palmar in Ixtapa, Isla Ixtapa, Playa Troncones, Playa Larga, Playa Blanca and Barra de Potosi. All of these beach communities have numerous beachfront restaurants with activities available to entertain anyone. If relaxation is your goal, grab a hammock, a good book or a siesta. Zihuatanejo has the old-fashioned charm of traditional Mexican culture. It is a town that sprang up from a handful of families who were mostly fishermen. Fishing continues to be a way of life for a large number of the local families and the the area is a popular sport fishing destination. Zihuatanejo's main attraction is its well-protected bay where traveling boaters often spend the winter months moored in its peaceful bay. The bay offers various beaches for relaxation, recreation, dining, or simply enjoying the abundantly beautiful scenery and laid-back local lifestyle. Zihuatanejo is the ideal vacation destination away from high rise hotels, fast food outlets and big box stores. The main part of downtown Zihuatanejo referred to as 'El Centro' is still rather old-fashioned with narrow streets made of paving-stones and where most people still walk to get around. The Zihuatanejo-Ixtapa International Airport is located about 15 minutes from town by car or taxi. It is possible to find direct flights from Canada and the U.S. especially during the peak vacation season between December and April. Zihuatanejo provides a warm and sunny climate year round with a short rainy season between July and October. Most visitors come to the area between mid November and late April but the low season also provides beautiful sunny weather with rains typically in the evenings keeping the areas vegetation lush. DISCOUNT: A 15% discount is provided for 28 nights of stay or greater. The discount is automatically generated upon booking. CANCELLATION POLICY: Return of reservation fee will be given up to 60 days prior to reserved arrival to condo. Within 30 days of intended reserved arrival date, NO return of fees will be given unless an alternative renter can be found. Reservations made within 30 days of stay will require full payment upon booking. No Refunds for No Shows. Travel Insurance is recommended for the unfortunate possibility of an unplanned emergency departure.